Many of you are asking about the very 'late 2012' iMac. Apple will start taking orders on Friday, November 30th, so I decided to offer some insights to help you decide if the iMac is the way to go. I'm using three questions received from readers as my outline. 1. Should I replace my old Mac Pro with the 2012 iMac or wait for the rumored 2013 Mac Pro? We can only speculate that the 2013 Mac Pro will have four internal drive bays (6Gbps?) and four PCIe (3.0?) slots. It's likely to have "killer" graphic options including the already announced NVIDIA Quadro K5000. Hopefully it will also have USB 3.0 and Thunderbolt ports. Maybe you don't need all those internal expansion options. Maybe the higher cost is a turnoff. The top-of-the-line 'late 2012' iMac Quad-Core will be as fast or faster than any Quad-Core Mac Pro. Plus it has the advantage of Thunderbolt and USB 3.0 ports. Then again, if you already own a very good display and an array of fast drives, even the 'mid 2012' refreshed Mac Pro might be a good bet for you -- especially if you add a fast graphics card like the NVIDIA Quadro K5000 or the MacVidCards' OS X friendly GeForce GTX 580. 2. If I already own a compatible display, why shouldn't I get the 2012 Mac mini Quad-Core i7 instead of the 2012 iMac Quad-Core i5 or i7? We attempted to answer that question with our shootout between the 2012 Quad-Core i7 Mac mini and our 2012 iMac "surrogate," the 2012 Quad-Core i7 MacBook Pro Retina. The key difference between the 2012 Mac mini and the 'late 2012' iMac is the graphics processor. The iMac (and MacBook Pro Retina) have a serious GPU. The Mac mini does not. How does that affect you? It will impact your ability to perform functions that are OpenCL and OpenGL intensive. We're not just talking games. We're talking key functions in Motion, Final Cut Pro, Photoshop, After Effects, etc. 3. Will the 2012 iMac be twice as fast as my 2010 iMac? 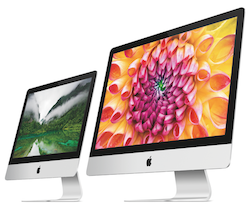 The 'late 2012' iMac will likely be twice as fast running apps that use all available cores. That's because your 2010 iMac has a Dual-Core i5 and the 2012 iMac you are considering has a Quad-Core i7. We often use Cinebench and/or GeekBench to demonstrate the gap between a Dual-Core and Quad-Core Mac. Also for graphics intensive functions, the 27" 2012 iMac with the GTX 675MX or 680MX will be much faster than the Radeon HD 5670 in your 21" 2010 iMac. At first I thought the 21.5" iMac's memory was not user upgradeable but OWC will be selling an upgrade kit. It will require disassembly of the iMac but they will provide tools and instructions. CHECK IT OUT! 2. Storage. Many functions are disk intensive (launching apps, opening or importing documents, saving and exporting documents, etc.). If you want disk activity to be significantly faster than your 2010's HDD, you should consider either the CTO Fusion drive or the CTO Solid State drive. Keep in mind that the 3TB Fusion drive does not support Boot Camp (at this time). However, the 1TB Fusion drive does. The entry level 'late 2012' iMac 21.5-inch 2.7GHz Quad-Core i5, 8GB of RAM, GeForce GT 640M, and 1TB hard drive sells for $1299. Compare that to the first iMac (1998) with a 233MHz G3, 32MB of RAM, Rage IIc video card, and 4GB hard drive for exactly the same price: $1299. if you choose to order the high-end 27" 'late 2012' iMac, it can get pricey. We plan to order the top model with the optional 3.4GHz Quad-Core i7, GeForce GTX 680MX, and 1TB Fusion drive. That will bring the tally to $2599. That's only $150 more than the 1984 Macintosh ($2495). Considering the entry level 2012 Mac Pro starts at $2499 with NO display, less memory (6GB), slower GPU (Radeon HD 5770), and slower drive (1TB 7200rpm HDD), our high-end 2012 CTO iMac looks like an even better deal. OWC has an upgrade kit for the 21.5" iMac. It requires disassembly but they provide the tools and the installation video. They will also offer upgrade modules for the 27" iMac. We will post that link when we have it.